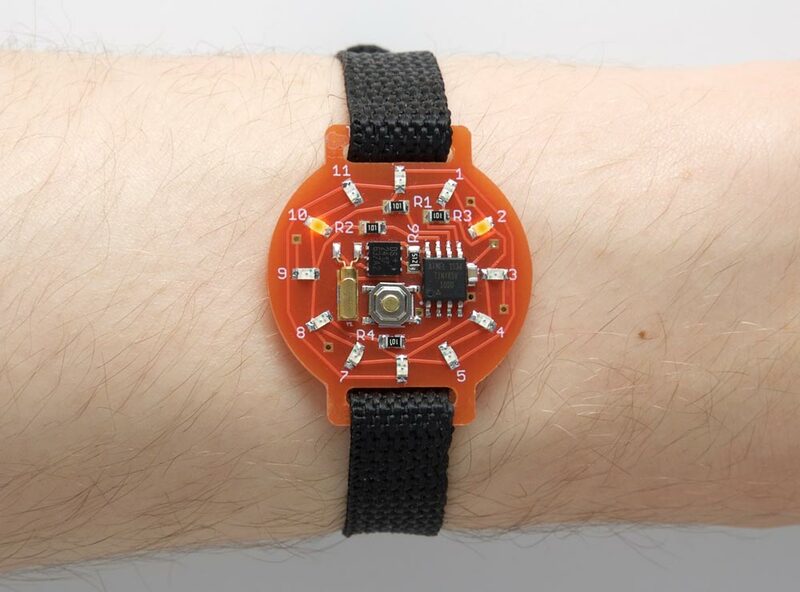 The Tiny Time 2 watch based on an ATtiny85 and a DS2417 RTC; it's ten to two. To show the time you press the button on the watch face, and it lights up LEDs to show the time like the hour and minute hands on a clock. The LEDs flash to distinguish the hours and minutes, and show intermediate times. My original Tiny Time Watch had three serious shortcomings: First, because it used the ATtiny85's internal oscillator for the timing, it was only accurate to within a few minutes every 24 hours. Secondly, because the ATtiny85 had to run all the time to do the timing, the current consumption was significant, and a CR2032 battery would only last a month or so. Thirdly, it only showed the time to the nearest five minutes. While puzzling about how to improve the watch I discovered Maxim Integrated's DS2417 RTC chip, a small 6-pin package which uses a 32.768 kHz crystal to keep accurate time . It can communicate with the main ATtiny85 processor via a 1-wire interface, which uses just one I/O pin to transmit and receive data. Because the RTC chip is doing the timing the ATtiny85 can stay asleep in low-power mode when it's not actually displaying the time, dramatically reducing the power consumption. Examples of how the Time Time 2 watch displays the time. For consistency with analogue watches, the Tiny Time Watch displays times later than half past the hour by lighting the next hour number. If only one LED lights up you know that both hands are pointing to the same hour mark. The total power consumption with no display is now just 1µA, giving an estimated battery life of over 10 years from a single CR2016 battery! Circuit of the ATtiny85-based Time Time 2 watch. The LEDs are 0805 size, and for this version of the watch I chose orange LEDs to match Ragworm's nice circuit board. I got mine from Bright Components in the UK, who sell them for under £1 for ten . The button is a miniature SMD push button available from Sparkfun , available from Proto-PIC in the UK . There are only two tracks on the reverse of the board, so it should be straightforward to use a single-sided board with wire links replacing these tracks. There's a link to the Eagle files at the end of the article if you want to make yourself a board. The completed Tiny Time 2 watch circuit board. The DS2417 RTC chip is in a TSOC package, and is probably the trickiest item to solder as its legs are tucked under the package. The LEDs should be soldered with the same orientation, with the negative sides facing the centre of the board. This section explains the various sections of the Tiny Time Watch program. The 12 LEDs are driven by the four I/O lines PB0, PB1, PB2, and PB4. PB3 is used for the 1-Wire interface, because using it on PB0-PB2 interfered with programming the ATtiny85. The first row of the array specifies which LEDs have their cathodes connected to PB0: the LED at 1 o'clock has its anode connected to PB1, the LED at 3 o'clock has its anode connected to PB2, and the LED at 5 o'clock has its anode connected to PB5. The values in the array corresponding to PB3 are set to -1. When the display is turned off the compare match interrupt is off, to avoid interfering with the 1-Wire interface. Up to two LEDs can be lit at once. The LED specified by the variable Hours is used to show the hours, and is displayed continuously. The LED specified by the variable Fivemins is used for the minutes. The bottom two bits of the variable Cycle determine which row is being displayed. For a given row the array Pins[row][i] is checked to see if any of the LEDs in that row need to be displayed. If so, the appropriate bits are set in the variable bits. This is then written to the port. When you first apply power to the watch it checks the MCUSR register to detect a power-on reset, and runs SetTime() which allows you to set the time to the nearest second. It works as follows: wait until the current time is an exact multiple of five minutes, and insert the battery. The watch will then start from 12:00, stepping through the display five minutes at a time. When the watch shows the time you inserted the battery, press the reset button. The watch will account for the additional time it took you to set the time, and then go to sleep. It's now ready for use. The first for loop flashes the previous five-minute mark and the second for loop flashes the next five-minute mark, according to where the time is between the two marks, for a total of five flashes. As explained above, the Tiny Time Watch displays times later than half past the hour by lighting the next hour number; this is implemented with the correction +1859 in the calculation of Hours. I compiled the program using Spence Konde's excellent new ATTiny Core, which now supports all the ATtiny processors and supersedes the various earlier ATtiny cores . Select the ATtinyx5 series option under the ATtiny Universal heading on the Boards menu. Then choose Timer 1 Clock: CPU, B.O.D. Disabled, ATtiny85, 8 MHz (internal) from the subsequent menus. Choose Burn Bootloader to set the fuses appropriately. I uploaded the program using a clip that fitted to the top of the SMD ATtiny85 , using Sparkfun's Tiny AVR Programmer Board; see ATtiny-Based Beginner's Kit. Because the timing is performed by the separate RTC chip there's no need to calibrate the ATtiny85's internal oscillator with this version of the watch. Here's the whole Tiny Time 2 Watch program: Tiny Time 2 Watch Program. Alternatively, get it on GitHub here together with the Eagle files for the PCB: Tiny Time 2 Watch on GitHub. 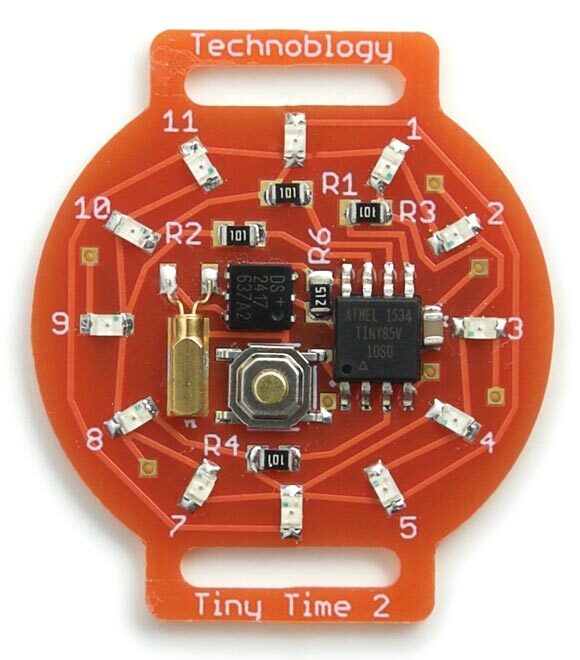 Or order a board from OSH Park here: Tiny Time 2 Watch Board. 14th December 2018: Due to the popularity of this project I've added a parts list, to help in sourcing the components. ^ 10x White 0805 Surface Mount (SMD/SMT) LED on Bright Components.